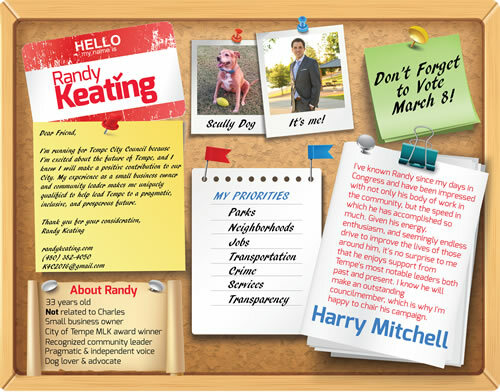 My name is Randy Keating, and I’m running to be your next city councilmember. There will be an open seat as my good friend Corey Woods will not be seeking reelection, so Tempe will have a new councilmember elected on March 8th. Before I go any further I’d like to answer the two most frequent questions I get while knocking doors and talking to voters. Are you related to Charles Keating? No relation whatsoever. My family is from Michigan, and is no way connected. How old do you have to be to run? 18, but I’m 33. I look young, which I always joke is a gift in life, but a curse in politics. Now that we’ve gotten that out of the way, let me tell you a little more about myself. I moved to Tempe in 2003, and as soon as I arrived, I was immediately impressed. My brother picked me up from Sky Harbor and we took the 202 to his apartment. When we passed Sun Devil Stadium (which at the time stood alone), I decided Tempe was going to my new home. Though I was only supposed to be visiting, I quickly began looking for a job and applied to ASU. My brother lived in Hayden Square off of Mill Avenue, which to a young man from a small town, seemed like the center of the universe. Tempe was clearly a very special city. I was lucky to find a job in a matter of days at a cyber café on 7th St and Mill, and was accepted to ASU where I studied Physics and Astronomy. In late 2009, I saw what I believed were too many injustices in the world, and I made a decision to be the change I wanted to see. Once I started, I found a great deal of satisfaction in helping others, and it quickly became a lifestyle. I didn’t know it at the time, but my life was about to take an immense and positive turn. I devoted countless hours as a full-time volunteer (on top of running my business), and began making the professional connections and developing the relationships in Tempe that would eventually lead to my candidacy for City Council. That whole story is a long one so I won’t post it here. I love to tell it though, so if you catch me on the street sometime, or I knock on your door during the course of the campaign, don’t be afraid to ask. Though I’ve been working to better our community for several years now, I still feel Tempe has given me so much, and am compelled to give back in every way I can. 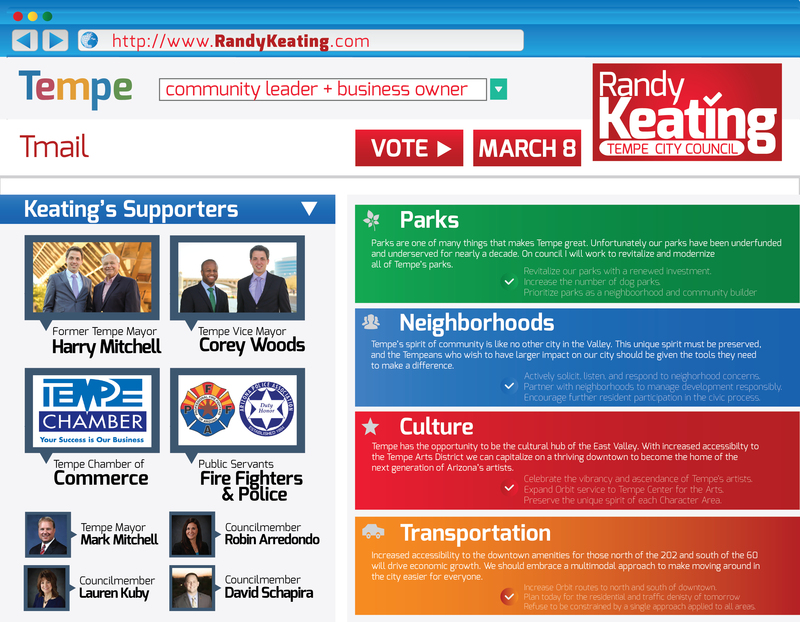 Because of Tempe I have friends, family, employment, my own business, and now, a chance to serve on City Council. I’m proud of the work I’ve done in Tempe, and am thrilled to have the opportunity to continue that work on the Tempe City Council, but there are two specific accomplishments I’d like to share with you. In January of 2015 the City of Tempe awarded me the Martin Luther King Diversity Award. I was surprised and honored to even be nominated, but even more so when I was told my nomination received 17 letters of support from leading Tempeans, more than any nominee has ever received. I’m extremely honored to have former Tempe Mayor Harry Mitchell as my campaign chairman. I was able to meet and work for Harry many years ago, and he has been a friend and a mentor ever since. Harry and I share a similar philosophy on the role of the city government, and once elected I will strive to carry that philosophy forward. I’m running for Tempe City Council because I’m excited about Tempe’s future, and I know I will make a positive contribution to our City. My experience as a small business owner and community leader makes me uniquely qualified to help lead Tempe in a moderate direction. This election, you will have the opportunity to vote for three people to lead Tempe into a new era, and there are quite a few good candidates for you to choose from. I’m asking that you use one of your votes to support me and my vision of a pragmatic, inclusive, sustainable, and prosperous Tempe.